Here we have a 8 bar solo incorporating both the previous lessons and developing the techniques in to something more musical. We start with a 2 bar phrase that involves bending up from the fifteenth fret of the B string from a D to an E using your third finger. Then back going down again to the D note pulling off to the B note at the twelfth fret on your first finger, then bending up again from the D to the E at the fifteenth fret using your third finger, and adding vibrato. As usual I have highlighted the notes that make this Dorian as well as where down strokes and upstrokes should be used. Bar three begins with a hammer on from the B on the twelfth fret of the B string to the C# at the fourteenth fret using your first and third fingers. Next play the E at the twelfth fret of the high E string, and then back to the previously played C#. The next section uses inside picking and starts with an down stroke on the G note at the fifteenth fret of the E string using your little finger. Then an upstroke on the B at the twelfth fret of the B string using your first finger. Then play a down stroke on the F# at the fourteenth fret of the E string using your third finger and then a final upstroke on the B at the twelfth fret again. Now we have a lick which uses a triplet hammer on and pull off using the first, third and fourth fingers on the twelfth, fourteenth and fifteenth frets of the B and G strings incorporating both the C# and B flat notes. They are separated by 2 eighth notes going from the A to the G on fourteenth and fifteenth frets of the G string, and rounded off with the E and D notes at the same frets on the D string. We finish this section on the E at the fourteenth fret of the D string on the E note and adding vibrato before performing a double stop using the first finger covering the G and B notes on their respective strings at the twelfth fret and bending approximately a quarter tone. This is made more exciting by playing and muting the string an eighth note before and plucking these notes with an upstroke. 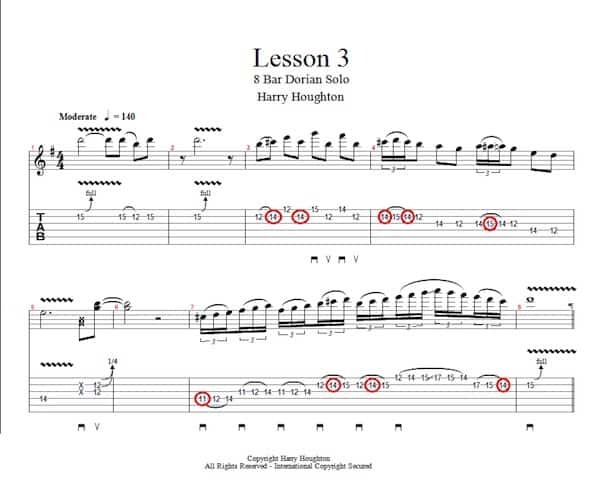 The final section of this solo consists of a legato run that repeats the same pattern every time you ascend a string. It is the E Dorian scale which is the same as the D major scale so in terms of scale shapes this can be thought of as your shape one 3 note per string scale shape. We start at the C# on the eleventh fret of the D string rising to D and E at the twelfth and fourteenth frets. Then we play exactly the same frets on the G string through F#, G and A. Then play the same 3 notes again before rising to the B string and playing the B, C# and D notes at the twelfth fourteenth and fifteenth frets. Again repeat those 3 notes before playing the same frets on the E string through E, F# and G before sliding up the seventeenth fret of the E string to A and pulling off down through G and F# at the fifteenth and fourteenth frets of the E string. We continue to pull off from the seventeenth fret of the B string from E, down to D and C# at the fifteenth and fourteenth frets before finally bending up from the fifteenth fret from D to E and adding plenty of vibrato. For more information visit the official Polyphoneek website.